is governed by an independent Board of Directors that includes SFU stakeholders, faculty and student representatives, as well as external members with expertise in real estate development, finance, law, and other related disciplines. As Trustee, that Board sets policy for SFU Community Trust, helping to shape the future of UniverCity. Dr. Patricia Hibbitts Vice-President Finance and Administration Simon Fraser University Barry Macdonald Partner PricewaterhouseCoopers LLP Howard Nemtin President Nemtin Consultants Ltd.
he dream was described in 1995 when then-president of Simon Fraser University, John Stubbs, announced an intention to build a “model sustainable community” on endowment lands adjacent to SFU’s remote campus atop Burnaby Mountain. Improbably, President Stubbs was calling for more than a community that would be “sustainable” in its own right— a goal that was far beyond the technical capacity of any 20th century developer. He was also calling for development that would help sustain his institution: he wanted to improve the standard and quality of urban planning, design, and construction; he wanted to build a “model” community without inflicting any damage to the environment or depleting the natural resources; he wanted to inject community life into the isolated hilltop campus; and he wanted to do so at a profit, creating a lasting legacy to support the teaching and research mission of the university. More than a few commentators said it couldn’t be done. imagined. Today, it is a community of 3,500 people, celebrated and, increasingly, emulated for its designs and practices. It has consistently set a national—and sometimes global—standard for sustainability, most recently by completing what is expected to be the first Living Building in Canada, a childcare centre that creates more energy and harvests or recycles more water than its inhabitants use, and one that was built and is operated with non-toxic components sourced within a 500 kilometre radius. 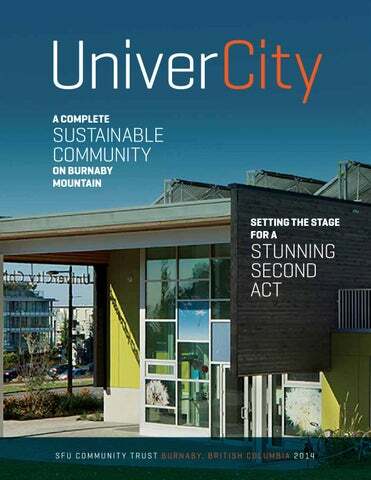 Having achieved those broad goals, UniverCity has also contributed more than $30 million in cash and an additional $15 million in physical benefits to Simon Fraser University, proceeds that support teaching and research in such diverse fields as bioinformatics, chronic disease, and climate change. Mountain Conservation Area—in return for the right to develop 4,500 units on the remaining 65 hectares. This guaranteed that UniverCity would have a small environmental footprint, primarily on land that had already been disturbed by campus development. It also contained development to an area that would be easily walkable, close to the campus and clustered conveniently around services and public transportation. percent more energy efficient and 40 percent more water efficient than the Model National Energy Code for Buildings. The Trust can also offer higher density to developers that achieve energy efficiency 45 percent higher than the MNECB or provide enhanced stormwater management features. In addition to its environmental element, “sustainability” also has social and economic components. Socially, a sustainable community must provide the services and amenities that its residents require. a “model of sustainability.” Even on a small footprint, it would still be a challenge to build a community of 10,000 people without damaging the environment or depleting the total resource. With its first phase completed and the second and third phases well underway, UniverCity is now home to 3,500 people, living in 1,595 units among 13 buildings. Phase 1 buildings, in the East Highlands, range from four-storey, woodframe multi-family residences to 12-storey concrete buildings—many of which have received awards for everything from environmental achievement to innovative financing. At UniverCity, that meant a High Street where residents and SFU students, faculty, and staff could buy the necessities of day-to-day life. Critically, that includes a grocery store, Nesters Market, which opened in 2010. The two mixeduse buildings that now delineate the south side of University High Street also include coffee shops and restaurants, a bank, a travel agency, a print shop, a hair salon, a dentist, two spiritual organizations and a dollar store. In response to demand for a more urban component close to the High Street and campus, the Trust negotiated with the City of Burnaby to transfer some of the density that had been planned for Phase 4 into Phase 3 in the West Highlands. The resulting buildings, which will be up to 20 storeys, include smaller units that are perfect for first-time home buyers, even as they take advantage of the high-value, 360 degree views—urban and natural, ocean and mountain. The Trust also worked with the provincial government and the Burnaby School District Board of Education to open the University Highlands Elementary School in 2010. This was a boon to homes with young children, which comprised only 20 percent of UniverCity in 2007, but 41 percent today. Every UniverCity resident is now a five to seven minute walk from school. Thanks to its reputation and convenience, University Highlands Elementary also attracts more than a third of its students from off mountain, another great convenience for parents who work or study at SFU. oriented homes. Working toward a population between 8,500 and 10,000 residents in as many as 4,500 units, the ultimate UniverCity density will be roughly 150 people per hectare (62 people per acre)— comparable to less than Vancouver neighbourhoods such as Yaletown (76 people/acre) or the West End (78 people/acre); more than the Yonge and Bloor neighbourhood in Toronto (54 people/acre); and similar to the Plateau in Montreal (66 people/acre). formance has been recognized by organizations such as the Prince’s Foundation for Building Community and the International Living Future Institute (see story, page 15). It is particularly gratifying to have a childcare centre that expects to be designated as Canada’s first Living Building (see story, page 8) —to prove that a truly sustainable project is environmentally possible, socially desirable and economically practical. But we are not satisfied. The challenge will be to translate the potential of a Living Building to a Living Community (see “Setting the Stage for a Stunning Second Act,” page 22). well as an environmental concept and we at the Trust are always conscious of our primary mandate— to generate endowment wealth for Simon Fraser University. So, we were extremely proud to build the childcare centre not just within the budget that we had set aside for a conventional building, but for 20 percent less.” This was a major departure from the first proposal, which called for a conventional childcare centre to be placed on the top floor of a planned six-storey parking garage. But when the Trust realized that the parkade was neither economic nor necessary, Director of Development Dale Mikkelsen suggested that the Trust attempt a Living Building instead. in mind, the Trust is indebted to Karen Marler from Hughes Condon Marler Architects and to Ledcor Special Projects, who tackled a project that was risky and unfamiliar, partly because they considered it the right thing to do, and partly because they believe this is the way of the future. In addition to creating a beautiful, innovative and sustainable design, Marler worked tirelessly with Ledcor, with subcontractors and with regulators to help bring it all together. She says that this project will have a profound impact on how she approaches future designs, and that every subcontractor now has a new toolkit—and a new list of closer, cheaper, more responsible and environmentally conscious suppliers. The Trust is equally grateful to our partners at the SFU Childcare Society. No matter the building, a childcare centre is only as good as its people and programming. The Society chose the Reggio Emilia approach—a preschool philosophy that emerged in the Reggio Emilia region of Italy after the Second World War. Responding to the war’s devastation, the parents crafted a method on the principles of respect, responsibility, and community, and a self-guided curriculum based on exploration and discovery in a supportive and enriching environment. In a complete and sustainable community, it’s a superlative fit. he University Highlands Elementary School is both a LEED® Gold place to learn and a teacher in its own right. The building’s environmentally benign features are so transparent that students and teachers can’t help but notice the state of the world around them—and the influence they have by their own actions and decisions. CLASSROOM support—and with an out-of-use academic building that the Trust purchased from SFU—the Burnaby Board of Education’s Director of Facilities Russ Sales took up UniverCity’s sustainability challenge and ran with it. ly adjust the lighting levels at all times of the day. And the meters for energy and water consumption are placed prominently, “so students can see the difference if they drop the temperature and put on a sweater,” Sales says. he best ideas often come in response to the most challenging problems—and one of the big problems facing the isolated Burnaby Mountain campus of Simon Fraser University at the turn of the last century was a complete lack of nearby affordable housing for faculty and staff. The solution was Verdant, a 60-unit building that offered family-oriented housing priced at 20 percent below market rates. These units were not subsidized in any conventional way. Rather, the SFU Community Trust agreed to lease land to the developer, Vancity Enterprises, at 30 percent below market value in return for a guarantee that the development would be reserved for SFU employees—and that the 20 percent discount would be passed along whenever units were resold (this condition being attached by covenant to the title). COMING SOON Centre Block: High Street mixed-use project with retail, services, and 60 apartments, a 17-storey, 98-suite residential tower at the corner of High Street and Tower Road, and 26 townhomes along Highland Court. Veritas: 158 suites in two four-storey buildings in the Slopes Neighbourhood, at the corner of Tower Road and University Crescent. COMING SOON The Slopes Neighbourhood (Phase 4) Our next phase of development will be built on eight parcels and will include townhomes and family-oriented apartments. The Slopes will also include a neighbourhood park and walkways connecting to the High Street, the University Highlands Elementary School, and to 28 kilometres of trails in the Burnaby Mountain Conservation Area. COMING SOON Lift: 53-suite courtyard residential building at the corner of High Street and University Crescent by Porte Development. UniverCity: $450 per sq. ft. Metrotown: $570 per sq. ft. UBC: $900 per sq. ft. Brentwood: $525 per sq. ft. North Vancouver: $625 per sq. ft. Coquitlam: $450 per sq. ft. Port Moody: $450 per sq. ft.
wo of the most prestigious, sustainable, and community-building agencies in the world have teamed up with the SFU Community Trust to learn lessons from the UniverCity experience and to raise the sustainability standard yet further in the development’s third and fourth phases. From the UK, the Prince’s Foundation for Building Community signed a Memorandum of Understanding with SFU in 2009 agreeing to work together to develop an international knowledge network that advances sustainable urban development. One of the first projects in that pursuit was a week-long workshop in 2011 using UniverCity as “a living laboratory for experimentation and discovery,” and marshalled a blue-chip list of planners and sustainable community experts to use the Prince’s Foundation’s multi-disciplinary methodology to engage stakeholders, develop physical configurations, and assess a range of design requirements for UniverCity’s future expansion. first part of this project included an intensive review and revision of UniverCity’s next development phase. Both of these relationships are ongoing, ensuring that UniverCity will continue to be at the global sustainability forefront—not just building buildings, but building community. Working with the Prince’s Foundation and the International Living Future Institute also helps UniverCity achieve its mandate to be a “model sustainable community.” The world will learn quickly of every success and the Foundation and the Institute will be eager to help others understand how to emulate UniverCity’s best practices. UniverCity AWARDS UniverCity receives a great deal of attention for its innovative approach to sustainable community building, earning many awards and honours for SFU Community Trust and its development partners. UniverCity’s winning reputation attracts national and international media attention, including coverage by CTV, CBC, Global, BC Business Magazine, Granville Magazine, Vancouver Magazine, Shared Vision, New York Times, Maclean’s, Grist, Dialogue, Business in Vancouver Green Edition, Toronto Star, Vancouver Province and Vancouver Sun. David Suzuki’s television program ‘The Nature of Things’ highlighted UniverCity as a healthy, walkable community on ‘The Weight of the World’, as did Metro Vancouver on their program ‘Our Livable Region’. UniverCity is also often featured as a leader in sustainable development at workshops and conferences across Canada, the USA, the UK, and beyond. hings that work well— efficiently and inexpensively —have always been celebrated for their “utility.” And the word “utility” has also been pressed into service to refer to any of the big systems that provide the kind of service and value to customers who could not manage or afford to build the necessary network on their own. Those are usually “public utilities”—sewer, water and energy systems. The SFU Community Trust has introduced one such utility into UniverCity, in the form of a District Energy System that will provide heat and hot water to hundreds of units in more than two dozen buildings from a single, highly efficient energy source. In the process, it will save a fortune in duplicated infrastructure. It will also reduce UniverCity’s associated greenhouse gas emissions by 70 percent—11,000 tonnes a year. Thanks to an additional B.C. government investment of $4.7 million, the system will also serve SFU directly, replacing the aging gas boilers that currently heat the university’s institutional buildings. he underlying goal of UniverCity is and always has been to help make Simon Fraser University better. That was the intent in 1964 when the B.C. government set aside lands for the new SFU campus on Burnaby Mountain: there was enough property on which to build Canada’s best comprehensive university and an additional 385 hectares that could be developed to build an endowment that would support SFU teaching and research. into an asset, cash,” says Pat Hibbitts, SFU’s Vice-President Finance and Administration and a member of the SFU Community Trust Board of Directors. The Trust has also contributed $15 million-plus in physical assets, everything from a new major water supply line to a town square— a community meeting place for students, faculty, staff, and residents. The cash will go to work as an endowment, generating interest income for university use. VP Hibbitts explains that the SFU Board of Governors decided in 2005 that the first $3 million per year of interest income would go to research. As the endowment gets larger (the Trust is aiming at an ultimate contribution between $135 and $150 million), the Governors will decide how to distribute the rest. • $30,000 toward SFU Urban Studies Program’s Initiative in Urban Sustainability and Development Fund. $5,000 to the Dr. Warren Gill Memorial Endowment Fund, awarded annually to a third year undergraduate student majoring in Human Geography for leadership and/or service within the university community or in representing SFU to the community at large. $5,000 to the Dr. Warren Gill Memorial Lecture, presented by SFU’s City Program. Each year a guest lecturer presents new, innovative, thought-provoking ideas about life in urban communities. • Over $6 million in funding to high-quality, interdisciplinary research projects. • Another $93,750 in funding for graduate fellowships to support 15 doctoral students in a range of areas, including linguistics, sociology, political science, English, and other disciplines within Humanities. •	Approximately $15 million worth of important infrastructure for SFU, including the Town Square enjoyed by students and utilized for community events. Community Planning. A $750 bursary awarded annually to an upper level Geography student. RESEARCH The Community Trust Endowment Fund (CTEF) provides up to five years of research funding, to a maximum of $500,000 per year for approved projects, of which there are currently seven: Human Evolutionary Studies: Interdisciplinary research into how evolution has affected everything from perception, thought and culture to prejudice, interpersonal violence and schizophrenia. Using a System Analytic Approach to Living with Chronic Diseases: Identifying individual and systemic solutions demonstrated by people with chronic diseases who are ‘living well’ in society. Secondary Effects of Climate Change on Human and Ecosystem Health: Researchers and experts in climate, water, air quality, disease, ecology, human health, risk analysis, emergency preparedness, and visualization focus on secondary climate-change effects such as the spread of infectious diseases, water availability, water quality, loss of biodiversity and social migration. nyone who has ever watched the construction of a large building will have an idea of how long it takes to get “out of the ground.” The fencing goes up, the diggers move in and the excavation begins, a parade of dump trucks carrying away earth and a longer parade of cement trucks arriving to contribute to the below-ground storeys of parking lots and equipment rooms. When construction finally peaks above the sidewalk, there is an explosion of progress, with the building seeming to add new floors by the day. That, figuratively, is where UniverCity is today. Proudly, we have built our foundation. Really, we have been “out of the ground” for some years—though we have actively avoided change that might seem explosive, preferring measured and careful preparation and execution. We began with a great plan, guided by an extensive community consultation and crafted by Hotson Bakker Architects (now DIALOG). Then we invested, early and adequately, in critical infrastructure. We took care of the roads; and took greater care of what was between them, ensuring a stormwater management system that would, if anything, improve the amount, quality and consistency of fresh water flowing down the mountain. We built a High Street with a selection of cafes, restaurants and services—for new residents and for the SFU students, staff, and faculty who had, for so long, been isolated on Burnaby Mountain. have set a high standard for green building performance, so far, only the Childcare Centre achieves the Living Building target of being truly environmentally neutral, which is why we are gratified that the International Living Future Institute (ILFI) has committed to helping us scale up our successes—from the level of specific buildings and services to encompass the entire community. We are currently reviewing plans for remaining undeveloped lands within the community, looking for the best way to ensure the most functional and convenient access between new residential developments and the High Street, school, Childcare Centre and other community amenities. Printed on 100% post-consumer recycled fibre.